Marquito Gonzales, an outstanding student and high school track star, is forced to return to Mexico with his undocumented parents. The young man has lost everything-his chance to go to college, his girlfriend, and his dreams. After ten years in America, Marquito is now a waiter at the upscale Sunset Point Hotel in Cabo San Lucas, and he is angry, confused, and vulnerable. When he meets a red-haired runaway radical named Ashley-a tattooed gringa who feeds his anger and resentment-together they formulate a plan to shut down the resort and terrorize the guests. Time-share owners at Sunset Point, Vera and Ollie Webster sit at Marquito’s table for breakfast each morning. Now retired, Ollie questions the value of his law career and ponders anew the purpose of life. Vera, a retired social worker, wants to do some good with their wealth before they die by helping the workers they have befriended, particularly Marquito, who seems so lost and upset. Can she match him up with Maribel, the dimpled breakfast cook who watches him with loving eyes? 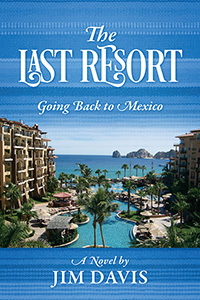 Set against the glorious backdrop of a five-star Mexican hotel, The Last Resort is an unforgettable novel about losing one dream and building another. It’s the story of young romance as well as the love between an older couple, longtime friends who together discover a greater purpose for their lives. Shortly after 9/11, Jules Lombard was face-to-face with someone he suspected of being an Al Qaeda sympathizer. He simply had to write this book. 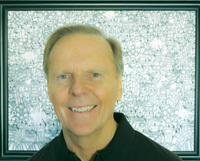 A Las Vegas resident, the author is also a blogger with a huge following and is an avid ballroom dancer. Exploding car gas tanks in a major East Coast city seal the fate of two anti-heroes and set in motion one of the biggest manhunts ever launched by the FBI. …And Soldiers is a story of men in their worst days and their strong-willed women who in the midst of a jumble of miscalculations are swept by the violent currents into the vortex of the world’s terror stage. The storyline delivers a punch from start to finish, inexorably drawing its motley crew of discontents and anti-heroes to their violent ends or retirement. The book explores the mindset of Muslims who burst onto America’s cities with vengeance in their hearts. Once you pick up this book and get into your usual rhythm, you will not lay it down until you see what happens in the end. The story line is gripping and the characters sizzle as if performing on stage. It is an intellectual narrative filled with suspense. Randall Bennett, Special Agent for the U.S. Department of State, Diplomatic Security Service, served 25 years in exotic and dangerous postings all over the world. With humor and other times through the heartbreak and drama that accompanies the loss of friends from violent acts of terrorists, his memoir reveals his evolution from a new Special Agent to one of the most experienced in the U.S. Government. 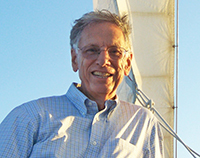 Bennett and his various teams approached each mission with intense focus, courage, and compassion. 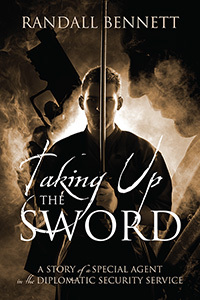 Taking Up the Sword relates the wide range of his adventures, from searching for narco-terrorist operations in the Colombian jungle with the true Tarzan of the Amazon, to rescuing abandoned family pets and a baby gorilla while protecting the American citizens in Kinshasa, Zaire, to risking his own life trying to save Wall Street Journal Reporter Daniel Pearl. It includes the actions that led to the capture of “The Dirty Bomber” Jose Padilla, as well as his nearly six years in Pakistan and a tour as head of security for the U.S. Diplomatic Mission in Iraq. Bennett survived bombings, rockets, and assaults against himself and those he was sworn to protect throughout his highly decorated career, all while doing a job he loves. With an original and fascinating perspective, Special Agent Bennett takes you behind the scenes-to the jungles, deserts, mountains, and exotic back streets of foreign countries-where these elite and highly trained Special Agents do things that books are written about and movies are made for-quietly and often without recognition.